Samsung Medison, a global medical equipment company and an affiliate of Samsung Electronics, is showcasing its new generation of premium ultrasound system HERA W10 and prototype of a chair-type ultrasound system HERA I10 at the 28th World Congress of the International Society of Ultrasound in Obstetrics & Gynecology (ISUOG) from October 21st to 24th in Singapore. HERA is a new premium platform which stands for Hyper-aperture Enhanced Reconstruction Architecture, incorporating Samsung’s new Crystal Architecture™ to provide advanced technology and capabilities with a new level of image quality. Samsung’s new platform combines Crystal Architecture™ with an advanced transducer technology called S-Vue™. It allows an 11-fold increase in processing power and 10 times the data transfer speed of Samsung’s previous system. It is expected to facilitate the examination of high-risk pregnancies and early diagnosis of abnormal fetus conditions. Crystal Architecture™ – Offers a superior image with single crystal probe technology S-Vue™, a new beamforming technology CrystalBeam™ and an advanced post-processing engine CrystalLive™. ShadowHDR™ – Provides a shadow suppressed image, especially applicable to highly attenuated regions such as fetal head and spine. HQ-Vision™ – Allows users get high resolution images to detect clinically important details. MV-Flow™ – Offers a detailed view of blood flow in relation to the surrounding tissues or pathology with an enhanced spatial and temporal resolution. LumiFlow™ – Provides a three-dimensional visualization of continuous and volumic vascular image. Wide Control Panel – Adopted rotatable control panel with a top-notch swivel mechanism. Allows moving range of 550mm from left to right and 219mm from top to bottom. Touch Customization – Allows users to easily change the position of the button on the touchscreen for each mode and feature. In addition to HERA W10, Samsung is unveiling a prototype of HERA I10, which shares the same platform as HERA W10, but with a completely new ergonomic redesign. HERA I10 is a next-generation chair-type ultrasound system with a design that is entirely different from the industry norm that meets the unique needs of Ob/Gyn professionals. HERA I10 provides a comfortable experience for both the doctor and the patient by addressing the discomfort caused by the spacing and the position of the clinicians and eliminating the need for the patient to shift the body, as it automatically adjusts for proper positioning. It also reduces the force required to move the control panel back and forth and the resistance force on the wrist. A new ultrasound solution SonoSync™ will also be introduced, which allows healthcare professionals to see real-time ultrasound scanning images in remote places1. SonoSync™ provides two-way communications through voice chatting and marking, improving accessibility. It can be installed on various devices such as smartphones, laptops and desktop PCs, allowing multilocation real-time training and education among healthcare professionals. Its Multiview feature also increases productivity by viewing multiple image scans in one screen. 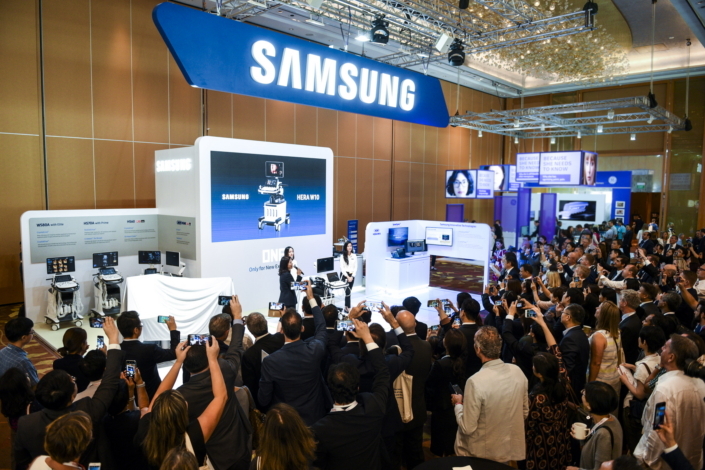 For more information on Samsung’s healthcare division, its subsidiaries and products please visit https://www.samsunghealthcare.com. 1SonoSync™ may not be used for diagnostic purposes at all times. Its availability may vary in different countries, according to regulatory approvals. Samsung Medison is a global leading medical device company, specializing in diagnostic imaging devices. With a mission to bring health and well-being of people’s lives, the company is committed to create a new future for medical professionals and patients around the world across various medical fields. In 2011, Samsung Medison became an affiliate company of Samsung Electronics, integrating world’s best IT, image processing, semiconductor and communication technologies into medical devices.